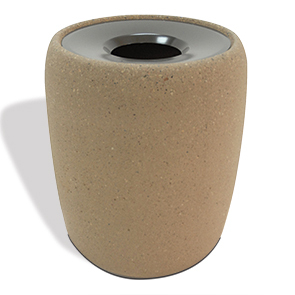 This precision crafted concrete receptacle showcases smooth, clean, classic lines that complement its fit within a variety of landscape placements. The aluminum funnel lid offers hands-free pitch-in disposal—promoting a sanitary litter-free environment from every angle. The heavy duty reinforced concrete construction allows this 43 gallon trash receptacle to withstand the harshest, most demanding climates. Standard and premium finishes with color options are available for this planter pot inspired receptacle.